It wasn’t until 1954 that soccer players in the Netherlands were allowed to be paid for their efforts on the field. Before that, only a few tried their luck in a foreign country. The first five, Gerrit Visser, Gerrit Keizer, Beb Bakhuys, Gerry Vreken and Faas Wilkes all had their own reasons to take this big step. The very first Dutch soccer player earning money was Gerrit Visser. He didn’t plan to, though. Visser was playing for Stormvogels, a club from the Dutch harbor city of IJmuiden, as an inside right. His biggest success with the club was the second place behind Dutch champion Feyenoord in the 1923-24 league. Visser collected seven caps and played with the Dutch team at the 1924 Olympics. A year later, 22 years of age, he emigrated to the United States. Early February 1926, Visser suddenly appears as a striker for professional American soccer club Bethlehem Steel. He has to replace top striker Archie Stark, who is injured. Visser performs up to expectations: he scores four goals in three league-matches, three of them in a 8-0 trashing of Newark. After those matches, Stark returned and scored even more than Visser did. Stark collected 43 league goals that year and would establish a world record the season after that. Visser knew he wasn't able to challenge Stark. So he leaves for Detroit Holley Carburator, playing in the local Detroit professional league. Although not really pursuing a soccer career in the States, his matches for Bethlehem Steel make Visser the first ever Dutch professional soccer player. Just like Visser, Gerrit Keizer (born 1910) wasn’t that keen on a professional soccer career, it just happened. Keizer was a talented goalkeeper for Ajax. Unfortunately, the club had more confidence in his rival Jan de Boer. Keizer had his own international wholesale business in vegetables, and frequently travelled to London. In 1930 he decides to live in the English capital for a while and, among other things, improve his English. He starts playing for Margrate, something of a franchise club for Arsenal. As world famous manager Herbert Chapman watched Keizer play, he gets him to play for Arsenal, at a six pound weekly wage. Keizer was called the Flying Dutchman as he flew to Amsterdam almost every week to also play for the Ajax reserves. Although Keizer showed his brilliance now and again for Arsenal, he could also make childish mistakes. All in all, Chapman wasn’t prepared to take that risk. He threw Keizer out of the team after twelve matches in which he never kept a clean sheet. Keizer continued to play for Charlton Athletic and Queens Park Rangers, but decided to return home to Ajax in 1933. Until 1948 (!) he was their undisputed number one in goal, and also was capped twice for the Dutch national team. Two matches in which, as one would expect, he was beaten a total of seven times. After the war Keizer was sentenced to six months in prison for smuggling British pounds into the Netherlands. He was a very successful businessman and a member of the Ajax board from 1955 until 1962. Unlike Visser and Keizer, Beb Bakhuys was a big star in the Netherlands. 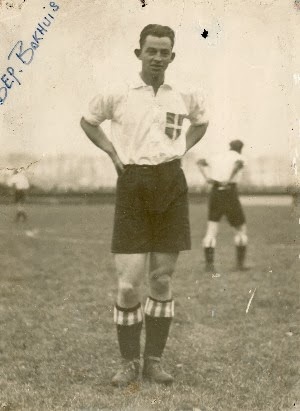 Elisa Hendrik ‘Beb’(derived from ‘baby’) was already playing for topclub HBS (Dutch champion 1925) at the age of sixteen, just a few months after the league title. After two years he changed to ZAC in Zwolle in 1927. Bakhuys soon made his debut for the Dutch national team. Young Bakhuys was also very keen on making a decent living, he had a degree in market gardening and left for the Dutch Indies (the colony where he was born) to make a name for himself. It didn’t work out, and Bakhuys returned to Zwolle in 1933. He was a lethal goalscorer, a very good header of the ball and the striker with the most powerful shot in the Netherlands. During 1934 Bakhuys played five international matches for the Netherlands, scoring twice each time. But he failed to do so in the most important macth of the year, at the 1934 World Cup against Switersland. Still, Bakhuys was the best player in the country. In 1937 VVV from the city of Venlo offered him a tobacco store if he would join them. Bakhuys accepted, but the Dutch FA suspended him as they interpreted it as a violation of his amateur status. So the Dutch striker was forced to look somewhere else, and left for FC Metz in France. Before the Second World War he played two seasons for Metz (40 league matches and fifteen goals). Bakhuys got a monthly wage of six hundred Dutch guilders (something close to 250 US dollar at the time). During the war Bakhuys was sent to Leipzig by the Germans to work as an instrument maker. In 1943, he is able to return to France, and played another season at FC Metz (1945-46: fourteen matches, two goals) . During the Second World War ADO from the city of The Hague won the Dutch league in 1942 and 1943. 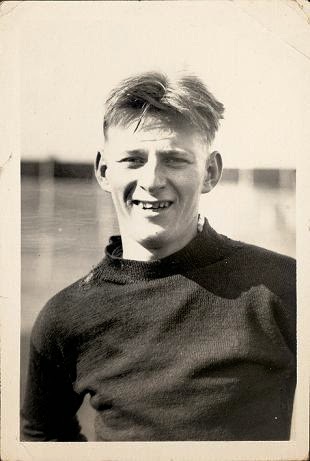 Striker Gerrit ‘Gerry’ Vreken was an important member of that team. For instance, Vreken scored the all decisive goal against Enschede in the very last match of the 1943 season, thereby clinching the title. Vreken was ordered to work in Germany in a factory, but didn’t feel like it. He had trouble thinking what to do. He was too scared to go in hiding, and he wanted very much to keep on playing for his club. So he voluntarily started working for the Arbeidsdienst, in a way collaborating with the German enemy. At his club everybody knew, Vreekens claims. But after the war, people though of him as a traitor, although technically he wasn’t. He wasn’t allowed to vote for ten years and was suspended by his club ADO. A friend arranged a test training for Vreken at AS Monaco, at that time playing in the second division in France. He was invited to stay, and played for Monaco from 1946 until 1949. After that, Vreken played another six seasons at FC Nantes. 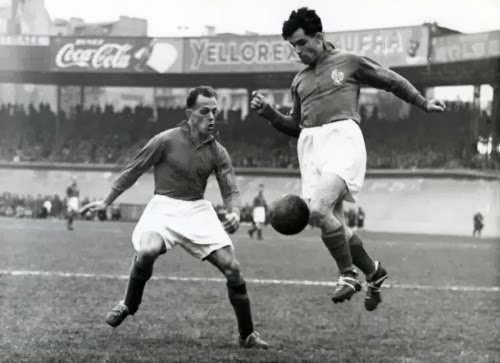 Highlight of his career after the war, was a match between foreign based professional Dutch players (most of them playing in France) against het national team of France in 1953. The Netherlands had experienced a flood disaster that winter, and the match tried to collect money for the victims. The Dutch professionals won 2-1, the match proved that professional soccer in the Netherlands might not be a bad idea after all. Vreken returned to the Netherlands for just a few years in the sixties, but he still had to deal with people calling him traitor. So he went back to France for the rest of his life, dying an embittered man on February 28, 2013. 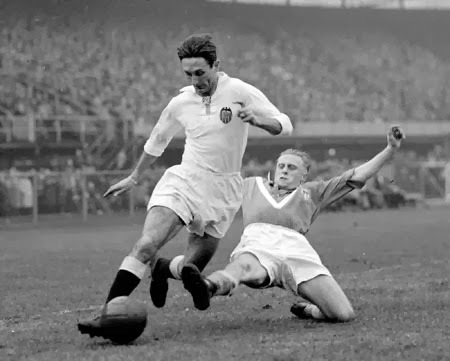 Maybe Faas Wilkes (born in Rotterdam in 1923) was the Diego Maradona or Lionel Messi of his time. Not physically – Wilkes was strong and tall – but in his style of play. Wilkes just dribbled and dribbled with the ball, to eventually get in such a position that he could score a goal. And he scored lots of goals. After the Second World War, Wilkes first encounter with getting paid for his soccer skills was when he and his brother Leen (goalkeeper at Xerxes) were offered two Bedford trucks if they would consider playing for MVV in Maastricht. Immediately the Dutch FA threatened Wilkes with a suspension for a year, so they both stayed at Xerxes. Three years later, Wilkes did turn professional, and was contracted by Internazionale Milan. Italy in those days was getting in foreign players by the dozens, mostly from Denmark, Sweden and Argentina. Wilkes had a wonderful time. He was an elegant player with good looks, which is always an advantage in Italy. He played there for three seasons, earning nearly hundred fifty thousand guilders and scoring 47 goals in 95 league matches. After that, Wilkes didn’t hit it off at AC Torino and moved to Spain a year later (1953). Valencia was very lucky to have him as a player. Wilkes scored another 38 goals in 62 league matches and was considered one of the top three foreign players in Spain, alongside Alfredo di Stefano (Real Madrid) and Luis Kubala (Barcelona). 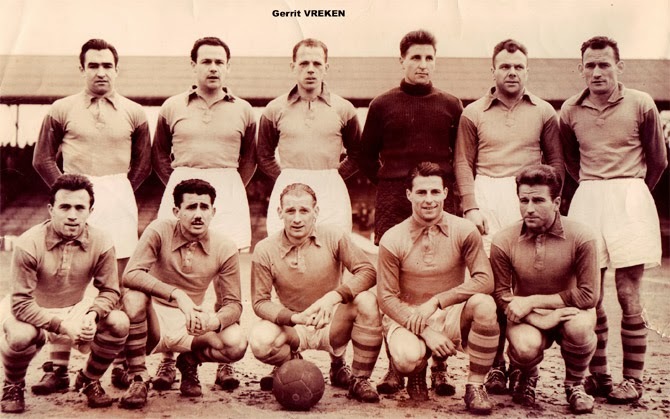 In 1956, Wilkes returns to the Netherlands to play for VVV in Venlo. Professionalism was installed in the Netherlands in 1954, and Wilkes plays another seven seasons (two for VVV, three for Fortuna ’54 and two more for Xerxes) to end his career in 1964, 41 years old.